Lloyd Alexander's saga, begun in The Book of Three, continues in these two books. Life has been getting busier, so again each of these books took a good two months for us to get through reading aloud, and required some recapping and reminding each time we managed to pick them up. 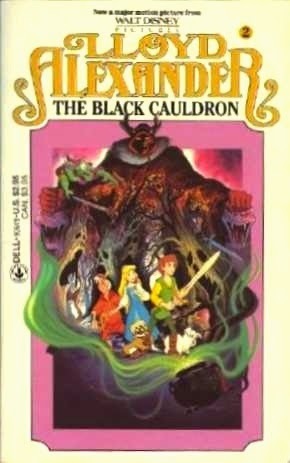 The Black Cauldron was one of my favorites of the series growing up, likely because of the high action plot and possibly because of the animated Disney version. (Though even in those tender years I recognized that the book was way better than the film and bristled at the changes made to adapt the story to the screen.) My boys had a similar response, having seen the movie a while ago. I think having a general idea of the storyline beforehand helped them stayed focused especially through the breaks in our reading. Gurgi is a favorite, of course, and in an incredibly magnanimous statement, the boys allowed that my "Gurgi voice" has improved as the series has gone on. High praise, indeed. Ellidyr, the proud youngest son of a noble, joins the quest for the Black Cauldron and rubs Taran wrong from their first interaction, but he also provided some great material for conversations with my sons about people's motivations for rude behavior, the importance of withholding judgment until you know all the facts, and how people who make bad choices - even really bad choices sometimes - can make good ones, too. This was particularly evident when contrasting Ellidyr with Morgant whose trajectory leads in the opposite direction. As for The Castle of Llyr, it's the most Eilonwy-centered of the books, which I appreciate. However, on this reading through I was disappointed to feel that she is presented as almost a caricature of herself yet again, at least until the final chapters. Taran's feelings for Eilonwy are more apparent to both him and the reader - and less interesting to my boys than just about any other aspect of the story. Glew is an interesting addition to the cast of characters and my boys were very interested to meet him and learn his story. And that of Llyan as well. I love the changes in Achren and am excited to re-read the next books as that journey continues.